Comedy Works Downtown is located just off the corner of 15th and Larimer Streets in Larimer Square. Since 1981, the club has operated downstairs in the basement of the Granite Building. Our box office is located in the upstairs lobby. If you arrive early you can enjoy a pre-show drink at our lobby bar which opens 1 hour before show time. Every Tuesday night we host a New Talent Night, which has launched the careers of comedy superstars such as Roseanne and Josh Blue. To secure time, you must call our New Talent Hotline at 303-477-7844. More information is available on our New Talent page. Comedy Works recommends Writer Square Parking Garage. Our customers park for just $5 after 5pm. 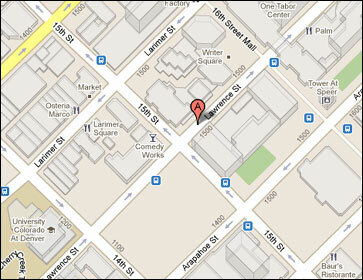 Writer Square is a secure, underground garage conveniently located on Lawrence Street, just past the light at 15th St. It is a left hand entrance into the garage. When you come upstairs, we will be directly across the street. For more information, call us at 303-595-3637.